From January 16 to 18, the Canadian Reformed Theological Seminary hosted a conference in Ancaster church on the topic caught in the title of this Bit to Read. Actually, they used a big name for the topic: hermeneutics. But they explained what they meant with the term: how does one correctly handle the Word of truth in today’s postmodern world? 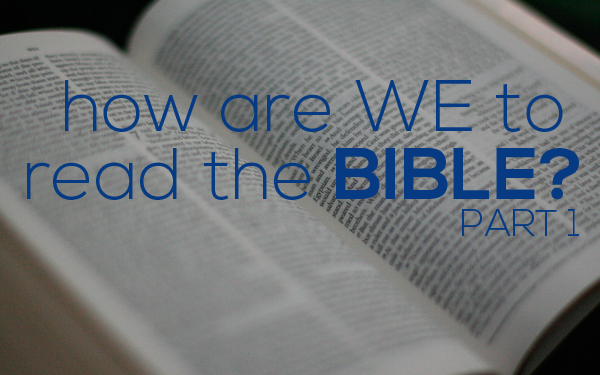 It comes down to: how are we to read the Bible? Half a dozen professors from the Theological University in Kampen (this institution trains ministers for the Reformed Churches in the Netherlands – those are our Dutch sister churches) winged their way across the Atlantic to participate in this Conference. Two professors from Mid-America Reformed Seminary in Dyer, Indiana (this institution contributes to the ministerial supply in the URC) braved wintry roads to add their contribution. And of course the faculty of our own Canadian Reformed Theological Seminary in Hamilton did what they could to supply a clear answer to that vital question. The Conference included two public evenings, and it was good to see that the Ancaster church was packed to the rafters on both evenings. For my part, I took in the two daytime programs too. By the time the Conference was over at 3:20 Saturday afternoon, I was more than happy to call it quits; one can absorb only so much…. Many of the members of the Canadian Reformed Churches have a Dutch background. Specifically, our (grand)parents were once members of the Reformed Churches of the Netherlands. There is, then, a very strong historic and emotional bond between the Canadian Reformed Churches and the Reformed Churches of the Netherlands. Smithville’s two previous ministers both came directly from these Dutch sister churches, and both had their training in the Theological University of Kampen. In the last dozen years or so, concern has slowly grown within our churches about developments we saw happening in the Dutch sister churches in general and in the Theological University in particular. In fact, our recent Synod of Carman wrote a pointed letter to the upcoming Dutch Synod explaining why developments in the Dutch churches worry us, and urging a change (see Acts 2013, Art 165). The heart of the concern lies in how the professors of Kampen are reading the Bible. Given that we remain sister churches with the RCN, it was considered right before God to do a Conference with these men in order to understand better what the Kampen men are thinking, and to remind each other of what the Lord Himself says on the subject. How does one Read the Bible? It was accepted by all that the Bible comes from God Himself, so that what is written on its pages does not come from human imagination or study, but comes from the Mind of holy God Himself. So the Bible contains no mistakes; whatever it says is the Truth. Yet this Word of God is not given to us in some unclear divine language, but infinite God has been pleased to communicate in a fashion finite people can understand – somewhat like parents simplifying their language to get across to their toddler. As we read the Bible, then, the rules common for reading a newspaper article, a book, or even this Bit to Read apply, ie, you get the sense of a particular word or sentence from the paragraph or page in which it’s written, and when some word or sentence is confusing you interpret the harder stuff in the light of easier words or sentences elsewhere in the article. That’s the plain logic of reading we all use. So far the professors of Kampen and Hamilton and MARS were all agreed. Differences arose, however, when it came to what you do with what a given text says. In the previous paragraph I made reference to a ‘toddler’. We all realize that the use of that word does not make this Bit to Read an article about how to raise toddlers. Genesis 1 uses the word ‘create’. Does that mean that that chapter of Scripture is about how the world got here? We’ve learned to say that Yes, Genesis 1 certainly tells us about our origin. (And we have good reason for saying that, because that’s the message you come away with after a plain reading of the chapter; besides, that’s the way the 4th commandment reads Genesis 1, and it’s how Isaiah and Jeremiah and Jesus and Paul, etc, read Genesis 1.) But the Kampen professors told us not to be so fast in jumping to that conclusion. Genesis 1, they said, isn’t about how we got here, but it’s instruction to Israel at Mt Sinai about how mighty God is not the author of evil. Just like you cannot go to the Bible to learn how to raise toddlers (because that’s not what the Bible is about; you need to study pedagogy for that – the example is mine), so you cannot go to the Bible to find out how the world got here – because that’s not what Genesis 1 is about, and so it’s not a fair question we should ask Genesis 1 to answer. A second example that illustrates how the Dutch professors were thinking comes from their treatment of 1 Timothy 2:12,13. These verses record Paul’s instruction: “I do not permit a woman to teach or to exercise authority over a man; rather, she is to remain quiet. For Adam was formed first, then Eve….” This passage featured on the Conference program because a report has recently surfaced within the Dutch sister churches arguing that it’s Biblical to ordain sisters of the congregation to the offices of minister, elder and deacon. 1 Timothy 2 would seem to say the opposite. So: how do you read 1 Timothy 2:12 to justify the conclusion that women may be ordained to the offices of the church? The Dutch brethren answered the question like this: when Paul wrote the prohibition of 1 Timothy 2, the culture Timothy lived in did not tolerate women in positions of leadership. If Paul in that situation had permitted women to teach in church or to have authority over men, he would have placed an unnecessary obstacle on the path of unbelievers to come to faith. Our western culture today, however, gives women a very inclusive role in public leadership. If we today, then, ban them from the offices of the church, we would place an obstacle in the path of modern people on their journey to faith in Jesus Christ. Had Paul written his letter to the church in Hamilton today, he would have written vs 12 to say that women would be permitted to teach and to have authority over men. That conviction, of course, raises the question of what you do with the “for” with which vs 13 begins. Doesn’t the word ‘for’ mean that Paul is forming his instruction about the woman’s silence on how God created people in the beginning – Adam first, then Eve? Well, we were told, with vs 13 Paul is indeed referring back to Genesis 1 & 2, but we need to be very careful in how we work with that because we’re reading our own understandings of Genesis 1 & 2 into Paul’s instruction in 1 Timothy 2, and we may be incorrect in how we understand those chapters from Genesis. So vs 13 doesn’t help us understand vs 12….